This lemon scented cold noodle is inspired from Hiyashi Chuka which is a type of Japanese cold style noodle serve with various topping and sesame dressing. It can be a great appetising dish for hot summer lunch whereby you can prepare everything ahead in the morning and chill it in the fridge. So by noontime you can enjoy a bowl of chilled noodle with dressing of your choice. Since this is pretty easy to prepare you can even packed it as one of the office dine lunch too. 1. In a small bowl, whisk all the dressing ingredients till combine and set aside while preparing the rest of the ingredients. 3. To prepare the omelette: whisk eggs and pinch of salt together then swirl the mixture into a preheated pan and cook over medium heat on both side. Remove, cool and cut into thin strips. 4. Cook lemon scented egg noodles in a pot of boiling salted water (add in pinch of salt) for about 6 minutes or until al dente. Rinse, soaked in ice water for 2 minutes, drain and set aside. 5. Divide the prepared noodles into two/three serving bowl, portion the shredded chicken, cucumber, omelette and tomato in each bowl. Serve together with dressing (store bought Japanese sesame dressing can be used as quick dressing for this noodle). Other than making cold salad noodle, you can also use this lemon scented noodle for stir-fry together with your favourite ingredients. For the above example; my mum pre-cook the noodle in boiling water until 80% cooked then use it to stir-fry with shrimp, sweet pea, carrot, mushroom and egg like an Asian Stir-fry Noodle dish. Lemon is super food where its pulp and rind are often used in cooking and baking. And if you do realise it is one of the common ingredients which I always include in most of my baking recipes. Even though I might not be a great fans of its sourish juice but I definitely loves the aroma of its refreshing rinds which enhance the flavour of the dish/bake. 1. Lightly beaten an egg in the provided liquid measuring cup then add in water to "1 cup marking" using the Egg + Water Mixture reading. 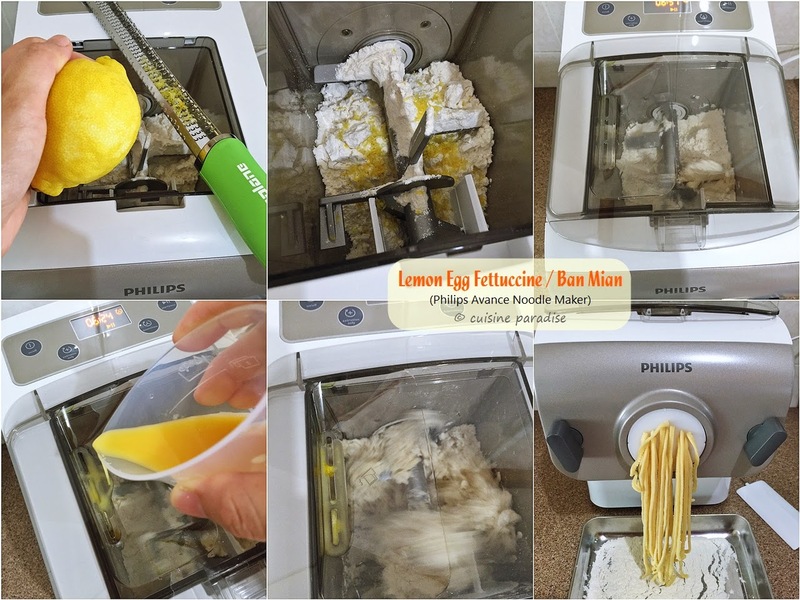 A quick demo clip on how to prepare Lemon Scented Egg Fettuccine. Wanton Mee (云吞面) is consider one of the popular noodles dish in Singapore with others like fish ball noodles or bak chor mee (minced meat noodles). Personally I prefer wanton mee because I am fans of wanton rather than fish ball and also I don't fancy the black vinegar taste in bak chor mee. So when I received the noodle maker, Spinach Noodle is automatic on the must try list because those that I have tried from noodle stalls were either over-cooked (with soggy texture) or comes with a grassy flavour ruin my appetite. Two weeks ago many were attracted to this gorgeous colour of the spinach noodle which I shared the post over at our Instagram. 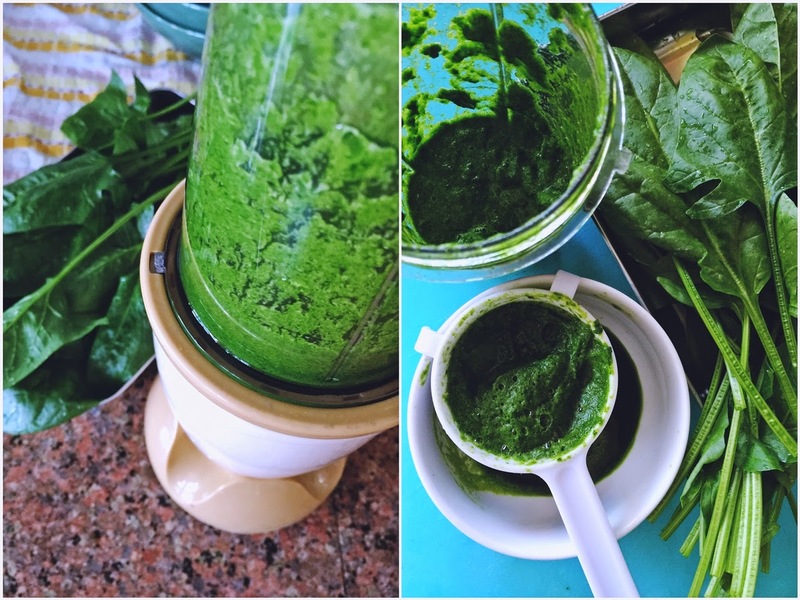 And to obtain that luxury green colour, egg was omitted and only fresh spinach juice is used as the main liquid for the recipe. 1. To prepare wanton: follow either the recipe here or use any of those ready made wanton from supermarkets. 4. Lastly add some blanched choy sum, BBQ pork and wanton on the prepared noodles. Serve immediately. 5. Alternatively, you can serve the noodles in anchovies broth together with vegetable, wanton and BBQ pork shown above. 1. Place Ikan Bilis in a plastic colander basket (for vegetables) and rinse it with a few change of water (to remove the saltiness, dirt, sand or etc). 2. Bring 1.2 Litres of water to boil in a stock pot, add in ginger, garlic, black peppercorns and prepared ikan bilis. 3. When the mixture comes to boil, lower the heat and simmer for about 10 minutes. 4. Turn off the heat, strain stock through sieve before using. 1. In a stock pot, saute garlic and onion with 1/2 tablespoon of oil till fragrant. Add in fish bone and black peppercorns and cook for 30 seconds (flipping once/twice). 2. Add in water and when the mixture comes to boil, lower the heat and simmer for at least 45 minutes to an hour. 3. Turn off the heat, strain stock through sieve before using. 6. You can also use the above soup broth to make Ban Mian (using the fettuccine shaping disc) together with ingredients like minced meat, vegetables, egg and fried anchovies. Spinach is full of vitamins, minerals and nutrients when consumed in juice form because it can be quickly and easily absorbed by the body. Furthermore they also contain rich source of manganese which is good in helping to protect our body cells from being damage. 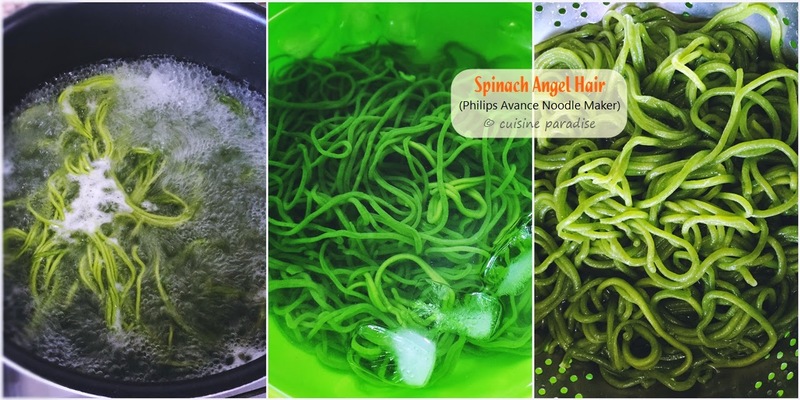 Am inspired to make this Spinach Angel Hair aka Mee Kai (thin noodle) which is one of the common noodle used for cooking dry version of Wanton Noodle. And in order to achieve that lovely jade green colour for my homemade wanton noodle, I use fresh spinach juice (no water added) for this recipe which yield a prefect end result. Cut the noodle into your desire length by using the flat cleaning tool. 2. 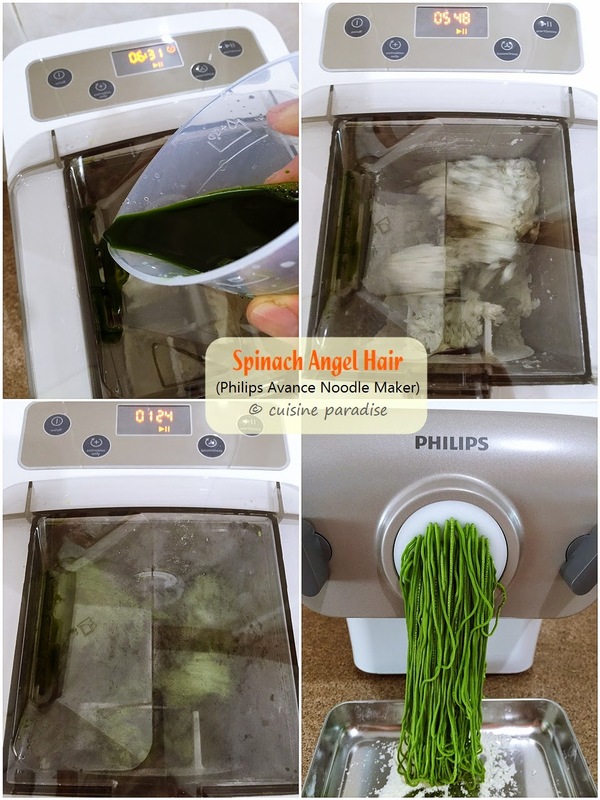 To make spinach angel hair; follow the same steps as shown above on the lemon scented egg fettuccine. Add in flour and lemon zest into the noodle maker, set bounciness to 7:00 minutes and start the making processing. 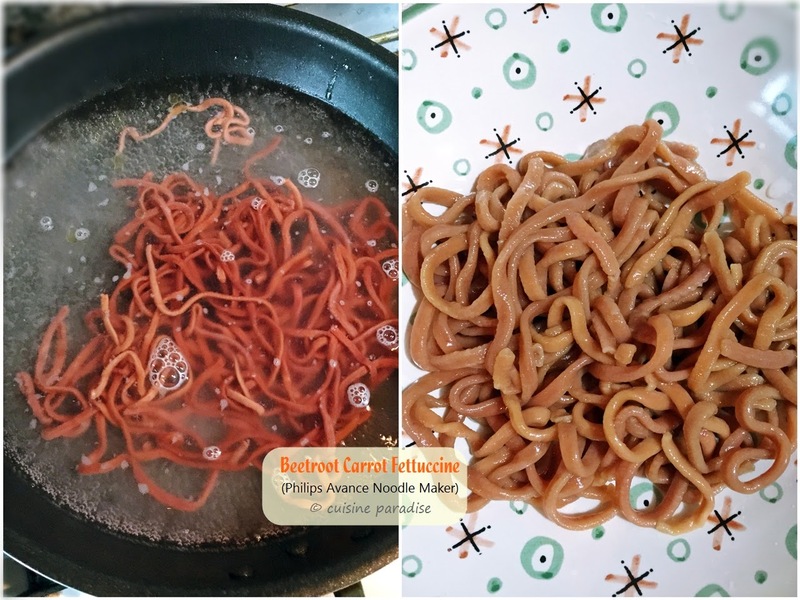 Due to the mixture of carrot and beetroot juice, this Beetroot Carrot Fettuccine has a distinct 'earthy' flavor which I find it more suitable for making soup noodle with simple ingredients such as Asian greens, mushroom and egg in either chicken or veggie broth. 1. In a pot of boiling salted water cook beetroot carrot fettuccine for about 6 minutes or until al dente. Rinse, drain well and set aside. 2. Bring soup stock to boil, add in vegetables (rinse and cut into sections), mushroom and fish cake; cook for 2 minutes then turn off the heat. 3. 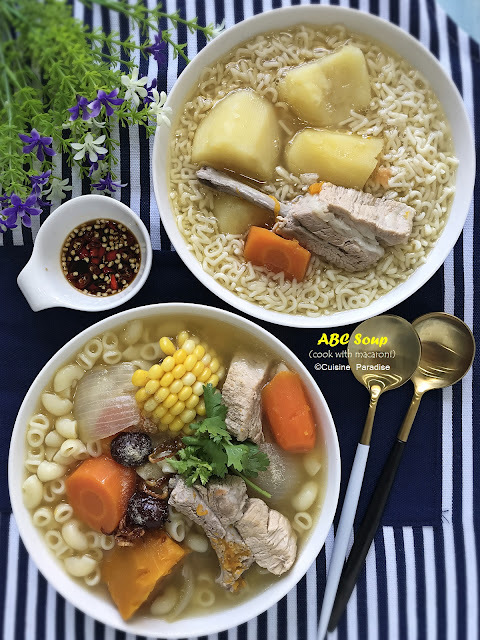 Divide prepared noodle into serving bowls, ladle hot soup mixture over the noodle. Top with soft boiled egg and some cut chilli and serve immediately. Ingredients for Beetroot Carrot Fettuccine. Made this Beetroot Carrot Fettuccine from the leftover beetroot juice that I used for Lemon Beetroot Penne in another recipe here. Instead of using all-purpose plain flour, I replace it with Korean wheat flour which gives a better texture. By the way you can choose to add in an egg to make egg noodle or omit it for a plain vegan version. 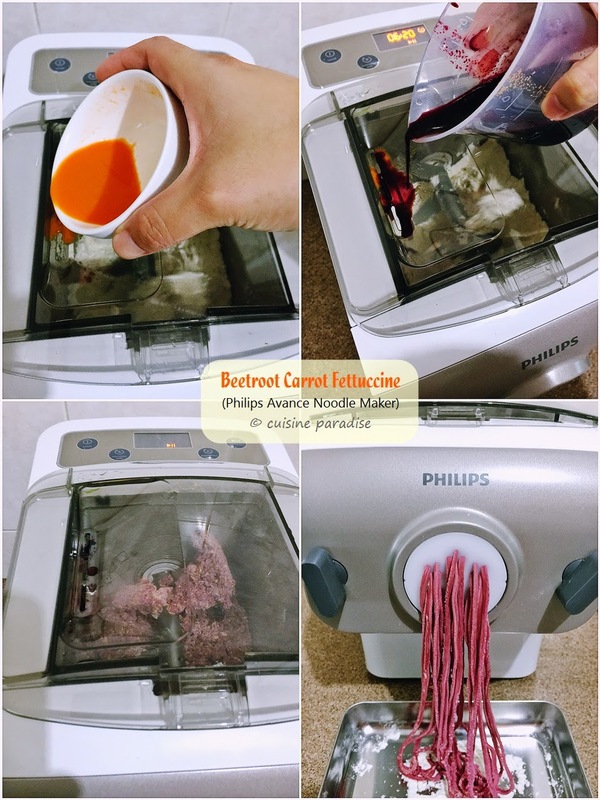 Steps on making the beetroot carrot fettuccine. 1. Using a blender or cold press juicer to obtain 95ml of fresh beetroot carrot juice and set aside (I use the left over carrot and beetroot juice from another recipe but you can blend 1 medium carrot and beetroot together). 2. To make beetroot carrot fettuccine; follow the same steps as shown above on the lemon scented egg fettuccine. Add flour into the noodle maker, set bounciness to 7:00 minutes and start the making processing. As Chinese New Year is around the corner, if you wish to make some longevity noodles as a sweet/savory dish, perhaps this recipe can be a good source to your reference. 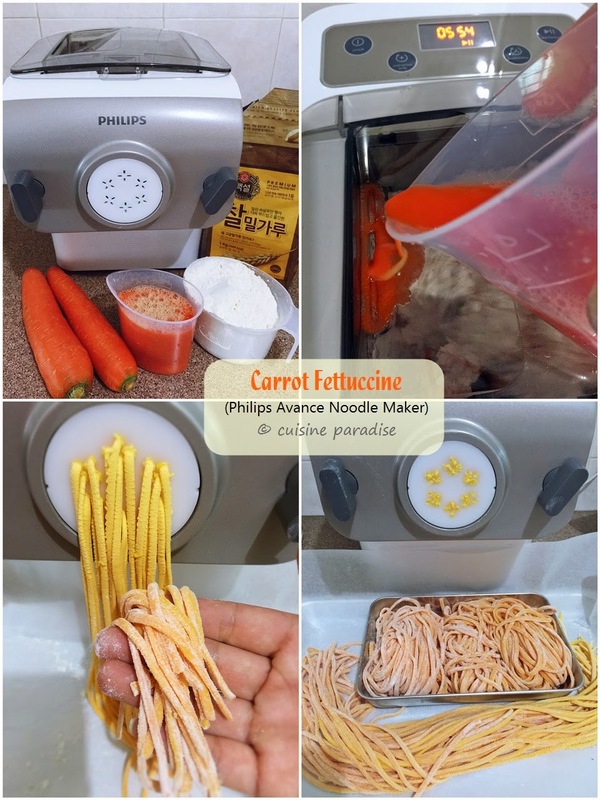 I would recommend making some Egg Fettuccine (using the recipe below with wheat flour, egg and water) for Ee Fu Noodle or Carrot Spaghetti/Angel Hair for the sweet version which you can find both cooking methods here. 1. 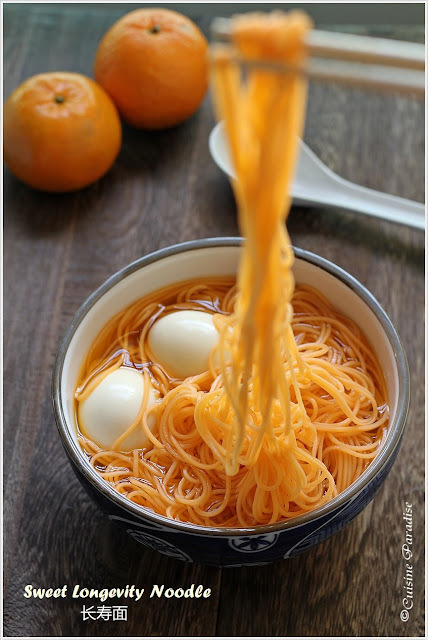 To make carrot noodle; follow the same steps as shown above on the lemon scented egg fettuccine. 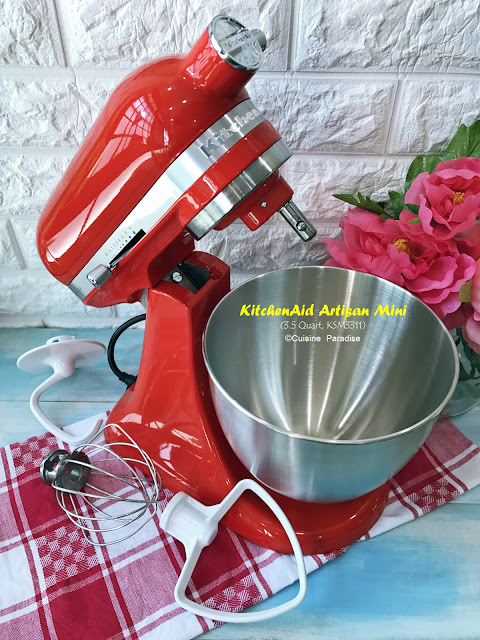 Fix the desire shaping disc (fettuccine, spaghetti or angel hair), add flour into the noodle maker, set bounciness to 7:00 minutes and start the making processing. Awesome noodles! Wow, this noodle maker is just amazing. I love all your noodles Ellena. Now you don't have to eat store-bought noodles anymore. wow.. i wonder if it could be available in Malaysia. looks pretty damn good and convenient. hi...would like to ask when you make noodle without egg, is the texture same with noodle with eggs? I have try to make both noodle with egg and without egg (i use spinach). The egg noodle i made was springy and tasty . But the spinach noodle(wihtout egg) was not springy, not tasty and the noodle is a bit sticky. Hope to hear advice from you. Thanks!! Hi Maelynn, sorry for my late reply. Yes. I have tried making spinach noodles with and without egg and they both taste quite similar. Perhaps like what you mentioned, the one with egg actually taste better than the one without but definitely not sticky texture. Did you follow the liquid measurement using the measuring cup which has two sides (egg and without egg)?